Telangana Minorities Residential Schools to recruit teachers: Those interested can submit their applications at the DMW office on the Collectorate premises at Abids here. The Ranga Reddy district administration has decided to recruit teachers for four new Telangana Minorities Residential Schools on outsourcing basis. A press note issued by the District Minorities’ Welfare office here said the last date for submission of applications is May 8. 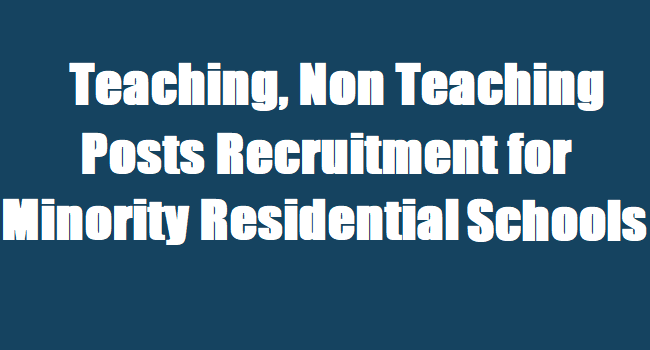 Candidates for teaching Urdu, Telugu, English, Science, Maths, Social, Hindi, Physical Education Teacher (PET) and Arts and Crafts apart from staff nurses and computer operators will be recruited for the new schools at Rajendranagar, Ballapur, Hayathnagar and Moinabad, the release said. For more details, candidates can call on 99492 16342 and 90590 18833. Mahabubabad Minority Residential Schools teaching, non teaching posts 2017 recruitment/ Mahabubabad Minority Residential Schools Teachers Recruitment / TSMW - TMREIS TGTs, Arts and Craft Teachers, Physical Education Teachers, Staff Nurse Recruitment 2017/ TSMRS-TS Minority Residential Schools Staff Recruitment: Telangana State Minority Welfare(tsmw) Department is going to start the 4 Minority Residential Schools in the Mahabubabad District. TMREIS and Mahabubabad District Collector has published the Teaching and Non Teaching Posts 2017 recruitment notification on 29/04/2017 and applications are invited from the eligible and interested candidates for filling up the TGT(Trained Graduate Teachers), Arts and Craft Teachers, Physical Education Teachers and Staff Nurse posts in the TS Minority Residential Schools on Outsourcing basis in Mahabubabad District. Here, TGT Urdu,TGT Telugu, TGT English, TGT Science, TGT Maths posts details, Arts and Craft Teacher Posts details, Physical Education Teacher Posts details, Staff Nurse Posts Details, eligibility criteria, application form, last date for apply, selection procedure and pay details are given here. Age limit: Candidates age limit should have minimum age is 21 year and maximum age is 34 years and 5 years age relaxation permissible to SC/ST Candidates and 65 years Upper age limit permissible to retired govt teachers. Interviews for contract teachers on May 11: The candidates who have applied for the post of contract teachers in Minority Gurukula High Schools, Bellampalli (Girls), Chennur (Boys) need to attend the interview on May 15 (Monday) at 11 am. The candidates should attend the interview by carrying all the original documents, said District Minority Welfare Officer K Shyamala. Interviews are conducted at District Collector and District Magistrate Office.